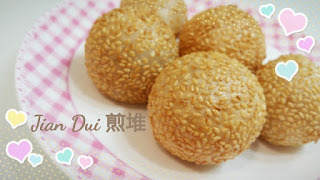 I tried making these Sesame Balls aka "Jian Dui" Thanks to Food Ink for the recipe with video. 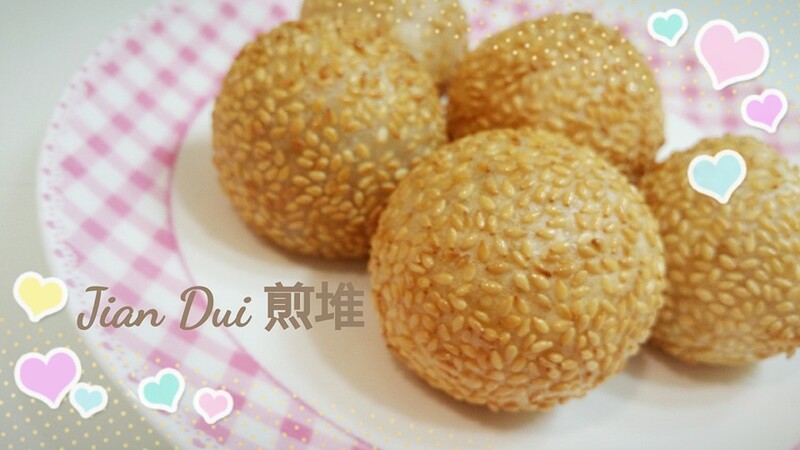 Jian Dui is a type of fried Chinese pastry, coated with sesame seeds on the outside and with fillings wrapped inside. This pastry is crisp and chewy, with a large hollow that expand after frying. You can use any filling of your preference, I used gula melaka grated coconut (which is not the usual filling) and surprisingly it tasted as delicious. The only thing to take note is the oil must not be too hot or it will turn brown faster while the dough will not be cooked. 1. Add sugar and water, mix well into a dough. 2. Roll dough into balls. Flatten dough and add fillings int the centre of balls. Seal it tightly and roll into a smooth balls..
3. Coat with white sesame seeds and fry the balls till golden brown.